The Future Of Flooding In St. Louis: Is There A Solution? Missouri Route 141/Interstate 44 intersection. Photo by Ursula Ruhl (SCT). Officials with the U.S. Army Corps of Engineers told a concerned audience at the Powder Valley Nature Center on Nov. 1 that there’s undoubtedly more rain — and flooding – in the long-range weather forecast for this area. Mayors from Kirkwood, Fenton and Valley Park, along with about 70 area residents, attended the Corps’ Meramec River Flood Risk Workshop. Local mayors introduced themselves before the program began and noted damage to their towns by flooding since 2015. The Fenton Board of Aldermen heard concerns from the residents and business owners about the recent flooding at its meeting on June 8. 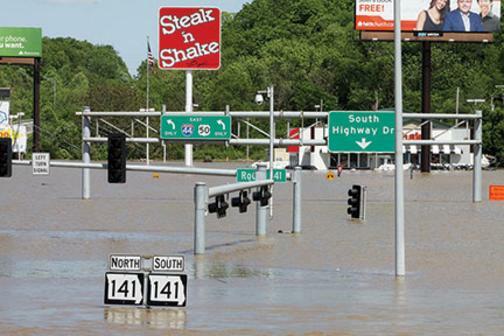 Historic flooding has plagued the area for the second time in less than 18 months. Comments ranged from the issues of floodplain development to the Valley Park levee. Listen below to hear first-hand the comments from the residents and business owners about their concerns and anxiety about the continued flooding.